I have been reading the Old Testament again, this time to mark the women in it and because Cedar Fort asked me to do a book on the women of the Old Testament. It won't be out for several years still, but I figured I'd better start studying. The last several weeks I have been in the book of 1 Samuel, which begins with the story of Hannah. I've always loved Hannah's story and have been impressed not only with her faith and her integrity, but also with her relationship with her husband Elkanah. He is exceptionally good and compassionate to Hannah in her trial, telling her, "Hannah, why weepest thou? and why eatest thou not? and why is thy heart grieved? am not I better to thee than ten sons? " (1 Sam. 1:8) Those words indicate to me that Elkanah was trying to remind Hannah that her worth as a woman was not dependent upon her ability to bear children and that she had innate worth, no matter what her situation. In addition Elkanah was unwavering in his support of Hannah's promise to the Lord to dedicate their son Samuel to the Lord's service in the temple. "And her father hear her vow, and her bond wherewith she hath bound her soul, and her father shall hold his peace at her: then all her vows shall stand, and every bond wherewith she hath bound her soul shall stand. But if her father disallow her in the day that he heareth; not any of her vows, or of her bonds wherewith she hath bound her soul, shall stand: and the Lord shall forgive her, because her father disallowed her." I thought that this distinction between the laws governing the vows of both men and women was very interesting. For men it was pretty straight forward, if you made a promise to God you better keep it or else you'd be held accountable before God for it. Yet for women the rules weren't as cut and dry (when are they ever). I think that the Lord understood that women's situations were often much more complicated because of their dependence upon their fathers and their husbands. Ideally every woman would have had a father or a husband who was righteous and would have supported her in her promises to the Lord, but as we know that wasn't always the case. It is interesting that at the end of Numbers 30 the Lord qualifies that if a husband "holds his peace" when he hears his wife make a covenant and allows her to keep it, but then somehow prevents her from fulfilling the promise she made to God, "then he shall bear her iniquity." (Numbers 30:15) A woman was only held accountable for her vow if she was allowed by the men in her life to keep it, if she was hindered by them then it was the man who would then be held accountable to God for the broken covenant. I think this is an interesting set of scriptures and I can see how it could still be applicable to women today. Even though many women in today's world have much more personal autonomy than women did in Old Testament times, I can still think of plenty of situations when a husband or father might hinder a woman from keeping her vow to the Lord. For example, a father who won't allow his daughter to be baptized, a husband who won't let his wife pay her tithing, a man who refuses to marry, a husband who won't support his wife in her callings, a father who won't let his daughter participate in church activities, or even a husband who refuses to consider another baby when his wife feels that there is another child waiting, can all be examples of unrighteous dominion that might keep a woman from fulfilling her covenants to the Lord. I think that understanding the Mosaic law concerning vows helps us understand something important about the type of man and husband Elkanah was. He respected and honored his wife and acknowledged her spiritual strength and power. 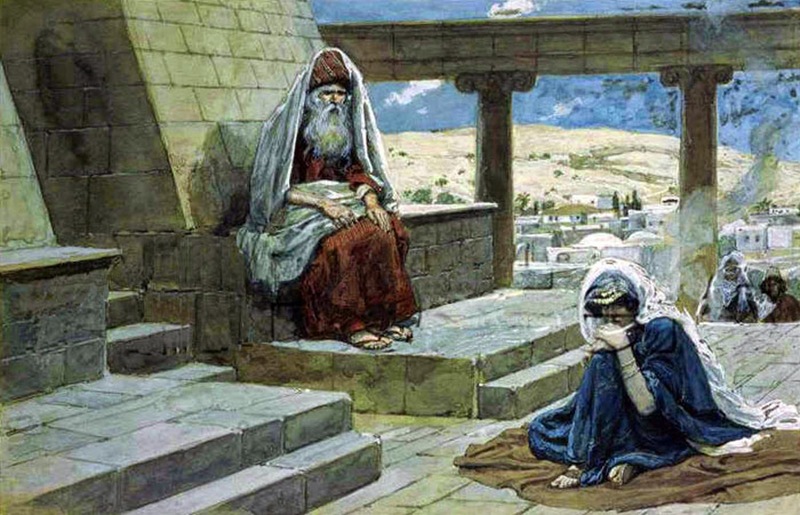 He realized that Hannah had made a sacred vow, a covenant, to God when she went to the temple and prayed for a son. 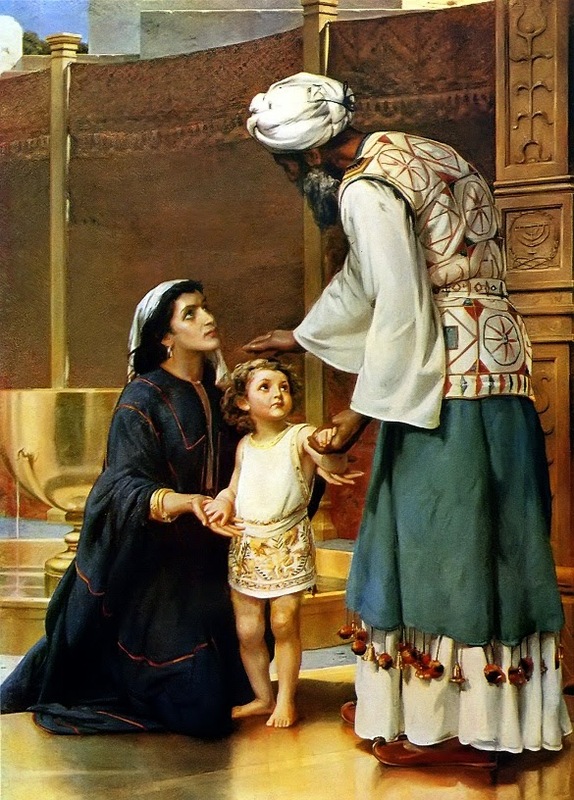 Her promise was that if God granted her the righteous desire of her heart, that she would dedicated her son to God by allowing him to serve in the temple from the time he was a child. I am sure that giving up their son could not have been an easy thing for either of them. Yet, it impresses me that Elkanah stood by Hannah in her covenant, one that she made without him present, and that he not only allowed her to keep it but also made sacrifices in order to make it possible. I think that this response by Elkanah indicates that he realized that it wasn't just men who are able to gain revelation, act with spiritual power, or make powerful covenants to God, but that women also have access to the same type of spiritual gifts as men. He seemed to acknowledge and respect his wife's spiritual power and was supportive of her relationship with God, even if it meant sacrifice on his side. I think that understanding this is an important part of Hannah's story, because without Elkanah's support of Hannah's covenant her story would have been much different, as would the rest of the Old Testament. The story of Elkanah and Hannah gives us a wonderful example of what a righteous marriage and partnership should look like; one in which both a husband and a wife acknowledge and support the covenants the other has made and both exercise spiritual power. Imagine how different the world would be for women if more marriages, and even father-daughter relationships, were like that. Thank you for sharing this. What a beautiful example of a righteous marriage partnership.